I stepped off the ferry with my belongings in two large green garbage bags. One broke as I crossed the main street in Edgartown, leaving me stranded on the curb amidst a mess. At 17, decades before the advent of cell phones, I had no one to call in any event and no way I could think of to carry on. My trip to the Vineyard, just one chapter in my futile quest for Lindsay Parker, was off to a farcical start. Lindsay had left our asbestos-ridden Dobbs Ferry Elementary School about the time it was condemned in around 1960. By 9th grade, she was enrolled at Horace Mann in Riverdale–a world away from the WPA-born Dobbs Ferry High School. Still, I foolishly hoped for a chance meeting with Lindsay, or at least a glimpse of her, as I drove around her wealthy neighborhood and circled her block–incessantly. And I did manage to make sporadic contact with her, which somehow enabled me to develop a vague plan (or hope) to get together with her on the Vineyard, as her family had a house on Chappaquiddick–the small adjoining island made famous when Teddy Kennedy drove off its bridge, killing Mary Jo Kopechne. As I sat on the curb with my broken Hefty bag and my clothes strewn about me, a stunning, girl–about 5’7” and my age with long straight auburn hair–stopped and asked if I needed help, which I certainly did. Nothing could have been further from my experience than being approached by this very pretty girl who’d appeared seemingly out of the blue. But after chatting on the curb and appraising my hapless state of affairs, Jane offered to let me store my stuff and stay the night in the room she’d rented in town. I’m pretty sure this was a good samaritan rescue, not a sexual overture–but I was rather clueless at the time and might have missed a golden opportunity. This would not be the last time Jane swooped down from nowhere into my life. The following year she showed up at Tufts University, where we were both beginning our freshman year. My college roommate, “Portnoy,” briefed on the Vineyard episode, for some unknown reason promptly nick-named her “Varushka.” Years later, Jane re-appeared in New York City after I’d moved there in 1977 to begin work as a fledgling lawyer. We were never close friends, and never lovers. All I can say is that at various points in my life Jane suddenly reappeared–and I was always happy to see her. 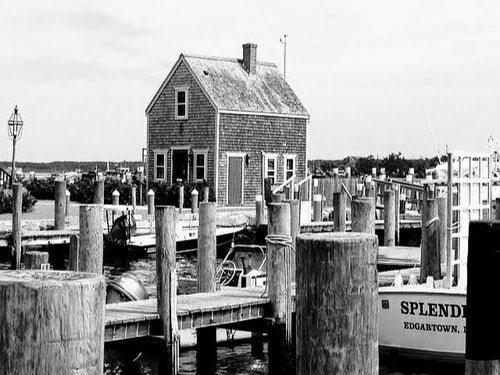 I emerged from Jane’s place in Edgartown the following morning and set out to explore the island. To avoid further trouble, I first took the small baggie of marijuana I’d been carrying and, after scouting for what seemed like a good hiding place, stashed it in a thick hedge on the side of a large white house. Walking around the corner to the front of the house, I was alarmed to see that it was a police station. I parted with my pot and slunk away. I spent the next night camping on the South Beach with a bunch of other teenage vagabonds, surrounded by signs warning that camping on the beach was strictly prohibited and that trespassers would be prosecuted. The following morning one of the kids asked if anyone wanted to go into town to shop for food. A few of us volunteered and we found our way to a small grocery store. I waited while my newfound friends did the shopping. As we left, the owner yelled at one of them: “Hold it young man! What do you have under the jacket?” The kid reached under his jacket, pulled out a package, and said: “Boiled ham, sir.” A forgiving soul, the shop owner yelled: “Well put it back!” The kid did so, only to reveal as we walked down the street that he’d retained an assortment of stolen packages under his jacket. Fifty years later, my memory of the fantasized rendezvous with Lindsay that had inspired my trip to the Vineyard is hazy. What I know for sure is that it was at most fleeting and disappointing. I visualize her having fun with a group of her friends, and perhaps waving to me, as the ferry to Chappaquiddick pulled away from the Edgartown town dock. So all I got for my troubles was a good story. Looking back on my trip to the Vineyard, it occurs to me that every facet of the story– prowling Lindsay’s exclusive neighborhood; stashing marijuana alongside a police station; camping illegally; and the illicit shopping escapade–shared something in common: They are just a few of the things I did back then that, had I been one of my black high school basketball teammates from the South Bronx–rather than a suburban white teenager–would likely have sent the cushy train I was riding to a successful adult life (and legal career) flying off the rails. But living within a protective bubble, my quest for Lindsay continued. I recall two additional rounds–although I can’t remember how either came about. The first was our walk on the no-Jews golf course near her house one night in the Spring of 1970–my senior year at Dobbs Ferry High and hers at Horace Mann. Lying on our backs on the 14th green, Lindsay said she’d gotten a condom. Although this is hard to fathom now, I didn’t comprehend the watershed offer she was making–or perhaps I was just frozen in anxious ignorance. We walked off the course a short while later–with Lindsay undoubtedly disgusted; the unopened condom still in her pocket destined for more productive use. The next and last time I remember seeing Lindsay was in a working class neighborhood on the outskirts of London on a weekday afternoon four years later, soon after I’d graduated from college and was setting out on a solo jaunt across Europe. Sitting in the drab living room of a brick row house–reminiscent of the Brooklyn basement apartment my great grandmother Schechter rented after they’d lost everything in the Depression–Lindsay held her infant daughter on her lap as we talked. The remainder of that 6 week European jaunt, travelling from country to country over nights on a Eurail pass, resembled my other solo adolescent trips. Strange things happen when you travel alone–especially when you’re young. Without the companionship–and distraction–of a partner, you’re on high alert and a magnet for odd people and events. Afterwards, it’s those strange events, especially the funny ones, that stick out in your mind. And with the passing decades, fading memory and repeated retellings combine to hone and perhaps enlarge the stories–to a point where they may seem implausible even to the honest narrator. I took three memorable journeys alone during my early days. Martha’s Vineyard was the first, followed by a trip across the country via my thumb in 1971 Europe, following my college graduation in 1974, was the last, as I stumbled thru my early 20’s struggling to figure out who I was. As I’ve told my sons, each of whom is traversing that minefield now, it took me quite a while–but things seem to have turned out ok. Loved it. It was easy to visualize the journey. Your stories are always so vivid and engaging. Trying desperately to figure out who Lindsay Parker is! The thing that struck me the most, though, is the incredible freedom our parents seemed to have no problem with when we were teenagers, and how different it was for our children growing up in such different, post 9-11, times. With all their advantages, they missed out on a lot of fun! Thanks for sharing! Fun read. Yep, this is the Richie that I knew. The law piece was more of a surprise! Another engaging Rothman story. Your vagabond style of travel is priceless. Thank you for sharing this, Rich! As usual, it was humorous, very thought-provoking and a lovely way to start my morning! Growing up in East Flatbush Brooklyn in the 70s, it was often the case for me that I was not as streetwise as I let on and far more of a homebody than I wanted my peers to believe. Your story makes me think of that. Keep ’em coming!